Definition: The Perfect Competition is a market structure where a large number of buyers and sellers are present, and all are engaged in the buying and selling of the homogeneous products at a single price prevailing in the market. 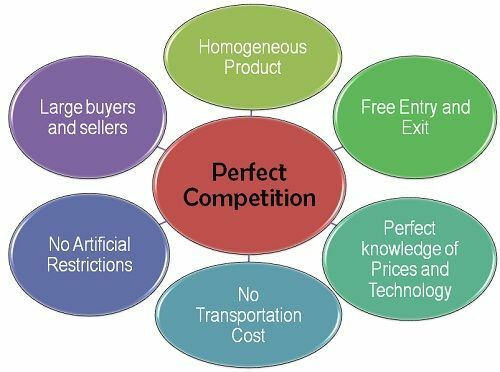 In other words, perfect competition also referred to as a pure competition, exists when there is no direct competition between the rivals and all sell identically the same products at a single price. Large number of buyers and sellers: In perfect competition, the buyers and sellers are large enough, that no individual can influence the price and the output of the industry. An individual customer cannot influence the price of the product, as he is too small in relation to the whole market. Similarly, a single seller cannot influence the levels of output, who is too small in relation to the gamut of sellers operating in the market. Homogeneous Product: Each competing firm offers the homogeneous product, such that no individual has a preference for a particular seller over the others. Salt, wheat, coal, etc. are some of the homogeneous products for which customers are indifferent and buy these from the one who charges a less price. Thus, an increase in the price would let the customer go to some other supplier. Free Entry and Exit: Under the perfect competition, the firms are free to enter or exit the industry. This implies, If a firm suffers from a huge loss due to the intense competition in the industry, then it is free to leave that industry and begin its business operations in any of the industry, it wants. Thus, there is no restriction on the mobility of sellers. Perfect knowledge of prices and technology: This implies, that both the buyers and sellers have complete knowledge of the market conditions such as the prices of products and the latest technology being used to produce it. Hence, they can buy or sell the products anywhere and anytime they want. No transportation cost: There is an absence of transportation cost, i.e. incurred in carrying the goods from one market to another. This is an essential condition of the perfect competition since the homogeneous product should have the same price across the market and if the transportation cost is added to it, then the prices may differ. Absence of Government and Artificial Restrictions: Under the perfect competition, both the buyers and sellers are free to buy and sell the goods and services. This means any customer can buy from any seller, and any seller can sell to any buyer.Thus, no restriction is imposed on either party. Also, the prices are liable to change freely as per the demand-supply conditions. In such a situation, no big producer and the government can intervene and control the demand, supply or price of the goods and services. Thus, under the perfect competition, a seller is the price taker and cannot influence the market price. Thank you very much, this is good and understandable. Reliable content and convenient for study preparation. Thanks a lot for providing this easy guidance !!!!!! !